Annual surveys report that nurses are the most trusted profession year after year. But, nurses underestimate the impact that they have on the health of patients/clients — on the healthcare delivery culture — and on society at large. ​The fact is that our society is watching not only what nurses do as a profession. It is watching what we do as individuals. Looking at our potential — this is an enormous position of power to both influence health one-on-one and to impact upon the health of society. Nursing practice can envision, advocate for and make major contributions to a healthy world. But, I am often also asked how do nurses relate to local and global health? This is a very important question. I believe the most important focus right now are the United Nations 17 Sustainable Development Goals (SDGs) that provide a foundation and framework where nurses — and all individuals, all communities, and all nations — can work toward the same goals to achieve healthy people living on a healthy planet. This gives us a voice and a platform to remember that whatever we are doing locally impacts us globally. As nurses. we know about the environmental and social determinants of health. We can be alert to what is happening environmentally. For example, where ! live in Santa Fe, New Mexico, we had a big snowmelt last March and brown water flowed into certain locations in our city water system. This lasted for three weeks. Luckily we had bottled water to drink. We had to boil our water before hand washing dishes to make sure it was safe. We had awareness of the health risks of dirty water. This is UN SDG # 6! Also, when we consider the local social determinants, we become aware that there is a lot of poverty and a breakdown of the primary family. So many people live without a direct relationship to a primary family member and have no one to call when they need help. This is another example of an issue that directly affects the health of people and the health of our neighbourhoods. This is an example of UN SDG # 1.! It’s important that we go to city council meetings and speak from our expertise — as nurses — and offer suggestions for a healthy community. This demonstrates UN SDG # 11! While nurses have a positive influence on health of the nation and the world, it is not generally acknowledged that nurses are the sustaining anchor for how every hospital, clinic, and community actually functions, throughout the world. Indeed, without nurses the health of humanity would collapse. But, to have a healthy nation, we need healthy nurses. Meanwhile, many of us have lost how to source from the personal wisdom that drew us into nursing in the first place. We find that we are expected to do more and to do better. We are stressed taking care of others. But we are not taking care of our selves. For instance, many report that they do not take lunch breaks — or short breaks, of any kind — regardless of where they work. If they eat, at all, it may be at a desk multi-tasking, answering e-mails or other work-related activities. These habits are not healthy. With these ideas in mind, the ANA has created a Grand Challenge to nurses everywhere — outlining five 'Domains' to encompass the self-care habits we need to give ourselves. 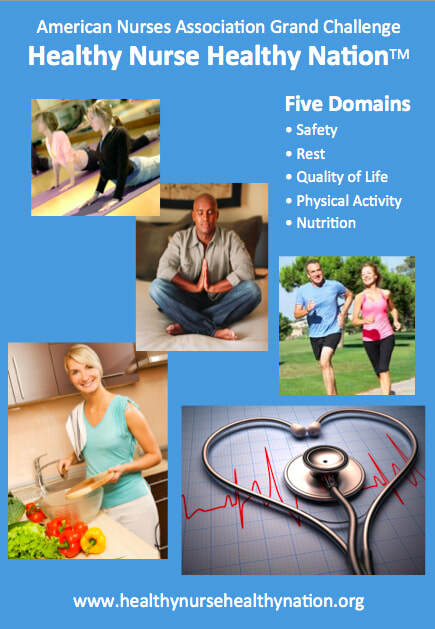 : Safety, Rest, Quality of Life, Physical Activity and Nutrition. To further explore the essential connections between healthy nurses and healthy nations — and to see these connections to a healthy world — this presentation was created to share in preparation for ANA's Healthy Nurse / Healthy Nation Grand Challenge. Barbara Dossey, PhD, RN, AHN-BC, FAAN, HWNC-BC, is internationally recognized as a pioneer in the holistic nursing and nurse coaching movements. She is a Florence Nightingale scholar, nurse theorist, and national and international speaker and teacher on the role of integrative nurse coaching in the emerging integrative health care paradigm. She is Co-Director, International Nurse Coach Association (INCA), North Miami, Florida; International Co-Director and Board Member, Nightingale Initiative for Global Health (NIGH), Washington, DC, and Kelwood, Manitoba, Canada; and Director, Holistic Nursing Consultants, Santa Fe, New Mexico. Barbara is an author or co-author of 25 books. Her most recent include Holistic Nursing: A Handbook for Practice (7th ed., 2016), Nurse Coaching: Integrative Approaches for Health and Wellbeing (2015), The Art and Science of Nurse Coaching: The Provider’s Guide to Coaching Scope and Competencies (2013), and Florence Nightingale: Mystic, Visionary, Healer (Centennial Commemorative Edition, 2010). Image Credits: All photos used on this webpage and in the above powerpoint are derived from Dr. Dossey's archives. 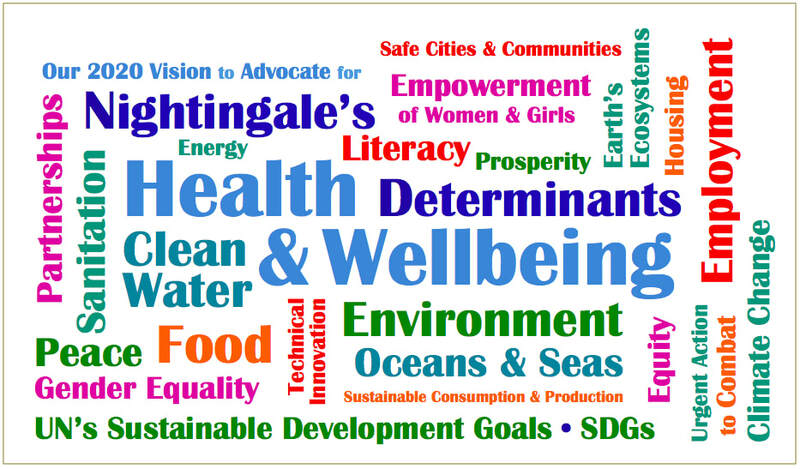 The above 'Health & Well-Being Determinants' Word Cloud was created by NIGH's graphics team. The colour wheel encompassing all 17 UN SDGs and their logos was accessed from the UN's World Meteorological Organization (WMO) and used with appreciative attribution.